We have just a few weeks before the annual Society of Children's Book Writers & Illustrators conference in New York City kicks off. It's going to be an incredible career boost, featuring the likes of Shaun Tan, Meg Rosoff, Mo Willems, Margaret Peterson Haddix--not to mention some of the best editors in the business. So a word about the SCBWI: I've never been a joiner. Quit the Brownies. Did not do the sorority thing. Have never owned any team booster uniforms. I don't do reunions. As a committed member of Club Unaffiliated, I hope I have some measure of authority when I say that the SCBWI is the best thing going for anyone wanting a career in children's literature. You'll learn what you need to learn and meet people you need to meet to get started (and in this category, I include your fellow writers and illustrators). I would not have my career without this group. If you're serious about your writing and illustrating, joining this organization and attending its conferences are the best investments you can make. There are still a couple of spots open in the winter conference. You can sign up right here. 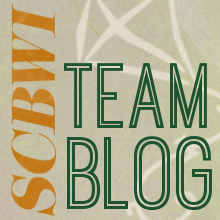 One thing Team Blog does in advance of these conferences is post interviews with faculty so you can get a sense for who they are and what you'll learn from them. Today I'm featuring an interview with Robert Brown, the national sales and program manager at Scholastic Book Fairs. Bob has long been a friend of children's book writers and has dedicated his career into turning kids into readers. And it's a lot of kids ... 35 million and their families each year. Especially in an age where bookstores are in peril, this way of reaching young readers is vital. First, some background about you: How long have you been at Scholastic, and what led you to the fairs? In 1987, I founded Cornerstone Books Incorporated (d/b/a Books, Bytes & Beyond), located in Bergen County, N.J. I joined Scholastic Book Fairs in August 2012 because of our shared mission to help children become lifelong readers. I have more than 20 years of experience bringing quality children’s literature to children, parents, teachers, and school administrators through a variety of literacy events. How many schools host them, and how many readers do you reach? Scholastic Book Fairs, working in partnership with schools across the county, hosts more than 120,000 book fairs each year providing more than 35 million students and their families with access to thousands of books. What's your process for choosing books, and what kinds of books tend to do best with kids? Scholastic Book Fairs and Scholastic Book Clubs team of book experts, which includes former educators, booksellers, and book fair and book club veterans, review thousands of titles from dozens of publishers every year. Every book fair and every book club flyer features a wide assortment of age-appropriate books, including the newest and most popular children’s books, as well as a selection of tried-and-true classics, numerous national and state award-winning titles, multicultural books, high-interest nonfiction and other books that will help instill in young children a love of reading and keep them reading for the rest of their lives. What are the all-time bestsellers? Series are generally the popular books for young readers. These include Captain Underpants, Pete the Cat, Skippyjon Jones, Pinkalicious, Fancy Nancy, Magic Tree House, Junie B. Jones, If You Give A…, Llama Llama, Clifford, Hank Zipzer, Goosebumps, Percy Jackson & the Olympians, and the Origami Yoda books. The Diary of a Wimpy Kid, Harry Potter, and the Hunger Games series are some of our all-time bestsellers. As kids and families increasingly adopt technology, what new opportunities will arise for books and authors through the book fairs? We have Storia, Scholastic’s exciting new teacher-recommended ereading app that is designed specifically for children. Storia ebooks are available for every age and reading level and many come enriched with functions to support kids’ reading development, including, comprehension quizzes, vocabulary activities and read-aloud for the younger readers. There are currently thousands of Storia ebooks, and the list keeps growing. Our book fair materials and displays also include digital enhancements such as QR Codes, where families can access more information about books on the fair, including author videos, book trailers, and reading tips for parents. We also offer an online book fair for families who are unable to attend the in-school event in person.